Abraham (Abe) J. Stobbe: churchman, carpenter, and farmer; born 1 November 1905 in Suvorovka Mennonite Settlement, Russia to John Peter Stobbe (8 February 1866, Schardau, Molotschna, South Russia - 11 September 1948, Abbotsford, British Columbia, Canada) and Margaretha (Friesen) Stobbe (13 April 1878, Alexanderpol, South Russia - 13 May 1962, Abbotsford, British Columbia). He was the fifth child in a family of ten sons and two daughters. On 11 August 1929 he married Mary Kornelson (4 July 1908 - 22 December 1992, Abbotsford, British Columbia) in Agassiz, British Columbia. Mary was the daughter of Franz A. Kornelson (1866-1929) and Bertha (Barwich) Kornelson (1881-1975). Abe and Mary had six daughters (two died young) and three sons (one died young). Abe died 14 June 1981 in Abbotsford, British Columbia (BC), Canada. In 1911 Abe moved to Canada with his parents and siblings, settling near Laird, Saskatchewan. He committed his life to Christ in 1918 and two years later was baptized by John A. Harder in the Borden Mennonite Brethren Church. In 1929 Abe joined his parents and most of his siblings in moving to Agassiz, BC. It was here that he and Mary married. In 1933 they moved to Abbotsford, British Columbia where they started farming and were also involved in the building of the South Abbotsford Mennonite Brethren Church. Abe appreciated the need to take formal studies to prepare him for work in the church. His studies at Bethany Bible School connected him with several early leaders in the Western Children’s Mission. Later he attended the Mennonite Brethren Bible College in Winnipeg for two years. Stobbe had a passion for church outreach. 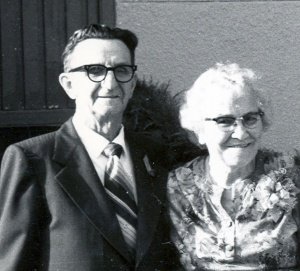 After graduating from Bethany Bible School in the spring of 1939, Abe joined Peter F. Ewert, John I. Wiebe, Klaas Enns and Henry Krahn in developing a missions work in Bradner, BC. This was the beginning of the Western Children’s Mission in British Columbia (later the West Coast Children’s Mission). For two years Abe J. Stobbe and John I. Wiebe traveled throughout the Fraser Valley to establish contact with Mennonite and German speaking people who had moved to small isolated communities. This work was instrumental in establishing permanent churches in Surrey (Strawberry Hill), New Westminister (Queensborough), Aldergrove (County Line), and Langley (Otter Road). Abe was also involved in establishing outreach programs for children in Haney (Websters Corner), and in the Mission area (Ruskin, McConnell Creek and Cedar Valley). This led to the organization of daily vacation Bible schools in these areas. Abe J. Stobbe was active in the South Abbotsford Mennonite Brethren Church. He was much appreciated as a youth choir director, Sunday school teacher and minister, and was ordained as a minister in 1956. Abe was also active in local community agencies with the Mennonite Central Committee and in person-to-person prison ministries. He was an early pioneer in the Fraser Valley in bringing the Christian message to communities beyond Mennonite circles. Stobbe, Abraham John. "Autobiography of Abraham John Stobbe." 19 May 1976. Mennonite Brethren Herald (9 October 1981). Penner, Peter. Reaching the Otherwise Unreached: An Historical Account of the West Coast Children’s Mission of B.C. Clearbrook: West Coast Children’s Mission of British Columbia, 1959. Stobbe, Abe J. South Abbotsford Mennonite Brethren Church – A History from 1932-1982. Abbotsford: South Abbotsford Mennonite Brethren Church, 1982. Stobbe, Ben. "Stobbe, Abraham J. (1905-1981)." Global Anabaptist Mennonite Encyclopedia Online. September 2004. Web. 19 Apr 2019. http://gameo.org/index.php?title=Stobbe,_Abraham_J._(1905-1981)&oldid=123522. Stobbe, Ben. (September 2004). Stobbe, Abraham J. (1905-1981). Global Anabaptist Mennonite Encyclopedia Online. Retrieved 19 April 2019, from http://gameo.org/index.php?title=Stobbe,_Abraham_J._(1905-1981)&oldid=123522. This page was last modified on 8 July 2014, at 23:45.